When people think of spinal cord injury (SCI) they tend to focus on paralysis and body movement. But post-injury, the biggest health risk is actually cardiovascular disease— it’s the number one cause of disability and death in people with SCI. Vancouver Coastal Health Research Institute scientists at ICORD are focusing on cardiovascular problems in SCI patients, in particular their inability to regulate blood pressure (BP). They’re especially interested in how BP dysregulation is linked to cognitive impairment. 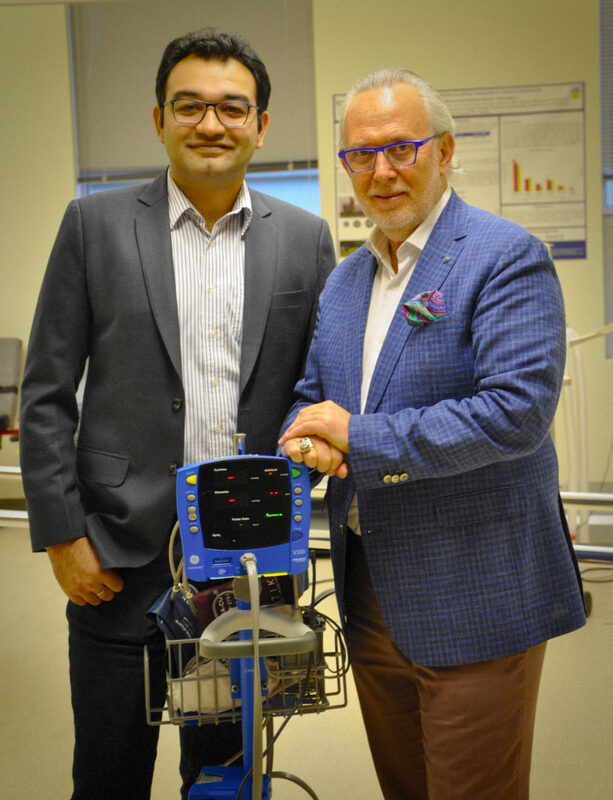 It’s an important focus: in a recent review study in Neurology, Dr. Andrei Krassioukov and his postdoctoral research fellow Dr. Rahul Sachdeva, found up to 60 per cent of people with SCI demonstrate some degree of cognitive impairment. Through their work, Drs. Krassioukov and Sachdeva are unravelling the connections between high rates of BP dysregulation and high rates of cognitive impairment. Dr. Krassioukov says it is an area of research that requires urgent attention. “Most people with SCI have problems with BP regulation. In the same person, it can be too low and then with just a slight stimulus—like a full bladder or a shoe lace that’s too tight—it can triple to dangerous levels.” In these situations, damaged nerves are sending the wrong signals to the brain. Blood vessels go into overdrive and narrow or widen excessively, raising the risk of either passing out, or having a stroke or heart attack. “This is a typical occurrence for many of my patients,” says Dr. Krassioukov. Dr. Krassioukov also notes that the changes in brain vessels in SCI patients mimic those found in able-bodied individuals who have hypertension and develop vascular dementia. Both researchers are looking for ways to restore normal cardiovascular control and prevent cognitive impairment for people with SCI. These innovative approaches include transplanting peripheral nerves to build a “bridge” from the brain, pharmacologically repairing part of the spinal cord, and implanting epidural devices to externally stimulate the body in an effort to better regulate BP. Dr. Krassioukov says getting blood pressure under control for SCI patients will have a ripple effect of benefits, not only for patients as it would decrease rates of depression and ischemia, but it would also reduce health care costs significantly—SCI patients often have to be hospitalized for hypertensive crises.